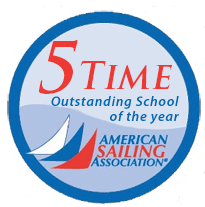 Over the last 50 years, we have perfected the formula for “Teaching the Art of Sailing While Having Fun,” earning many Outstanding School of the Year awards from the American Sailing Association. At Lanier Sailing Academy, we take you as a true beginner and transform you into an experienced skipper able to operate medium sized sailboats on lakes and bays for day sailing. Our sailing lessons for beginners, (Basic Keelboat Course BKB-101), will certify you to operate sailboats big enough to comfortably take friends and family as your crew. Our advance sailing lessons on large cruising sailboats are available at our Pensacola, Florida facility. While lake sailing is an enjoyable day or weekend trip, our Pensacola location gives you access to large bays, the Intracoastal Waterway and the offshore experiences in the Gulf of Mexico. Our 6 day, live-aboard sailing classes will give you the talent and confidence to make your island-hopping or offshore sailing dreams come true. If you can, stop by our docks for a visit and you’ll see how “we enjoy making your sailing dreams come true”. We love to talk sailing! Lanier Sailing Academy provides certifications/ curriculums from the American Sailing Association. We take your education seriously while the fun we have along the way is legendary. We enjoy making your sailing dreams come true. All sailing courses are certified by American Sailing Association (ASA). You can choose either of our school locations to start your sailing lessons: Atlanta, GA or Pensacola, FL. Feel free to contact us with any questions or to register. 800-684-9463 (WIND). We love to talk sailing.